Please join us as we unveil the memorial windows to commemorate the history of Japanese Canadians and cherry blossom trees planted in 1977. Before 1942, Oppenheimer Park was the centre of a thriving Japanese Canadian community. 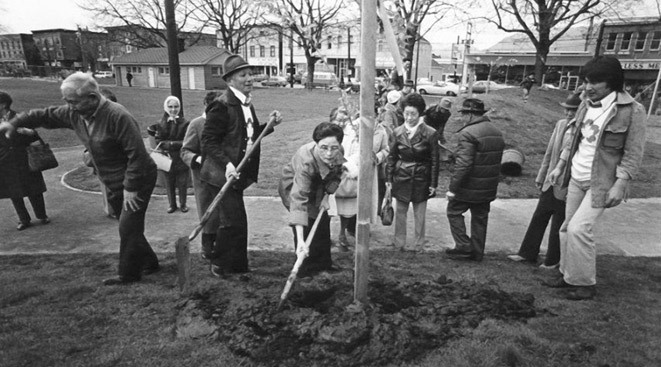 On April 16, 1977, with the support of the City of Vancouver, over 70 Issei (First Generation) Japanese Canadian seniors completed the planting of 21 Sakura (flowering cherry trees) in the Park to celebrate the 100th year anniversary of Canada’s first known immigrant from Japan. The 1977 Centennial plantings recognized the Japanese Canadian heritage in the area and the trees remain as living reminders for future generations. During the redevelopment of the park and relocation of the field house in 2009, one Sakura was transplanted to another area of the park and two were removed. The Oppenheimer Park Commemorative Task Force and Legacy Sakura sub-committee (also known as The Coalition To Save The Legacy Sakura of Oppenheimer Park) determined the importance of commemorating the lost Sakura and celebrating the history of the Japanese Canadian settlement in the community around Oppenheimer Park. On September 19, 2011, the legacy sakura windows designed by John Endo Greenaway were installed in Oppenheimer Park field house with a haiku poem and text that explains the significance of the trees. The ceremony includes performances from Japanese Canadian, First Nations and Oppenheimer Park communities, film screening, photo display and more! We acknowledge that Oppenheimer Park is located and the ceremony will be held on unceded Indigenous land belonging to the Coast Salish peoples. Supported by City of Vancouver Oppenheimer Park Commemorative Project. Organized by Oppenheimer Park, Oppenheimer Park Commemorative Task Force and Save the Legacy Sakura of Oppenheimer Park Coalition.